A Net Entertainment (NetEnt) slot based on the spooky pirate theme, Ghost Pirates slot challenges players to win a top fixed jackpot of 1,500 coins. NetEnt’s Ghost Pirates slot comes with 5 reels and up to 243 ways to win. Players can choose to play 3, 9, 27, 81, or 243 ways to win. The coin value range per active line is $0.01 to $0.50, and players can bet anywhere in the range of $0.25 to $62.50. Once they have placed their bets, players only have to hit the Spin button to set the reels spinning. They will win payouts if a winning combination is displayed on the reels. If players dislike the idea of manually hitting the Spin button, they can use the slot’s Autoplay feature to set the reels spinning automatically. The slot also has a Skill Stop feature, which allows players to hit winning combinations by stopping the reels in mid spin. Players can also customize their gaming experience by altering the game settings as they wish. Ghost Pirates is a slot for players who like the themes of ghosts and pirates. NetEnt has cleverly blended these two popular themes to give players one of the most innovative slots in its portfolio. This beautifully designed slot features attractive graphics, realistic audio effects, and entertaining animations. Players are challenged to get on board a spooky pirate ship and hunt for treasures. In keeping with its theme, the reels are packed with icons of pirates such as One-Eyed Ed and Peggy Rotten, along with other pirate-related symbols such as Polly, Mad Monkey, muskets, necklaces, maps, rum, cannon, and anchor. The Ghost Pirate symbol serves as the wild and substitutes for all other symbols, helping players create winning combination. This symbol can also substitute for the Treasure Chest scatter symbol to help players unlock the free spins round. The Treasure Chest scatter can appear anywhere on the reels and help players win attractive payouts. If players land three, four, or five Treasure Chest scatter symbols anywhere on the reels, they will receive scatter payouts of x5, x20, and x50, respectively. If players land three, four, or five scatter symbols, they will also receive 15, 20, or 25 free games, respectively. If players spin a winning combination during a free game, their prize for that combination will get tripled. The good news is that this feature can be re-activated while playing a free game. Once the free spin round ends, players will be returned to the base game. 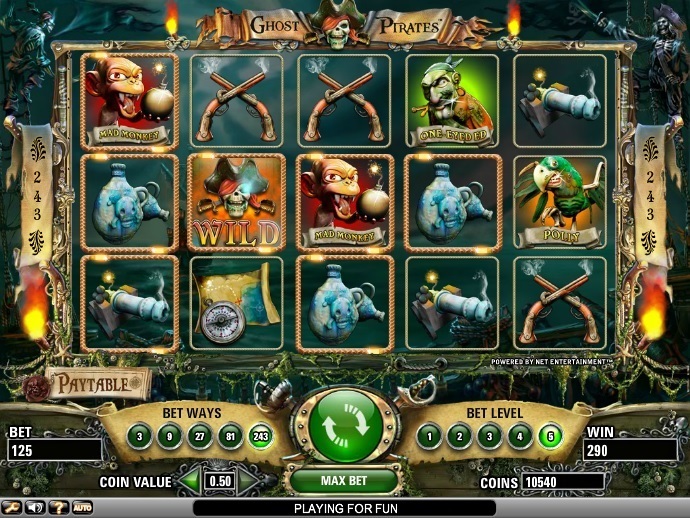 Ghost Pirates is a lucrative slot to play although its top fixed payouts are on the small side. Players shouldn’t forget that the free spins with tripled wins feature can help them win plenty more coins.